A Grace Brethren author hopes her book will help children who have been sexually abused face their fears and be able to tell their story to a trusted adult. 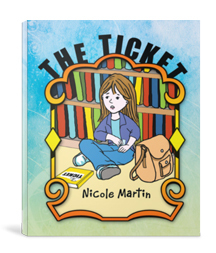 The Ticket, written by Nicole Martin, is an “eye-opening and inspiring book” that tells the story of Gracie who was sexually abused. A typical young girl, Gracie goes to school, plays with her friends, and is often in the trusted care of The Man. When he crosses the line from reliable friend to sexual predator, her life changes. Yet she finds a way to share her deepest secret so that she didn’t have to live in fear any longer. Martin, who attends ValleyLife Church, a Grace Brethren congregation in Peoria, Ariz. (Ed Waken, pastor), hopes this book will do the same for those who read it. Martin, who struggled with dyslexia as a child, never dreamed that she would write a book. However, she says that God had other plans. Her experiences and heart behind the story led her to a place where writing the book was feasible. There were many challenges in the process—for example, it “brought up pains of my own,” Martin said. She hopes that the book soon might be found in every doctor’s office, counseling office, and even school library, so that hurting children everywhere may get help. For more information or to purchase a copy of the book, go to graciesticket.com.